Chung's fight summaries reminded me of a project I'd started several months ago, a list of all of Guts' kills: who/what they were, and when they took place. I'd given up on this a while back due to the sheer boredom this project summons up. It's a pretty painstaking process. This list includes all on-screen kills that Guts was responsible for. That means, if his sword was swinging THROUGH someone, it counts. If, in the next panel, there are a display of bodies, each one with blood, or an identifiable injury, and Guts was directly responsible for their deaths, counts. If you see any that I missed, please by all means help the cause out. 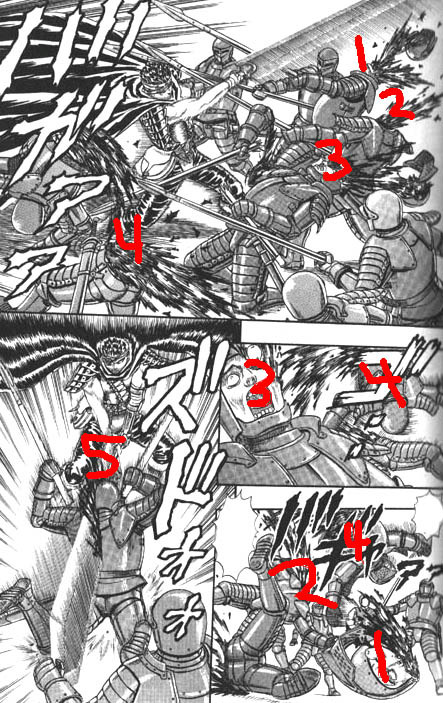 Re: Guts' Kill Roster: How many people has he REALLY killed? The four bandits you listed killed on page 15 are in fact the same two bandits. Notice how they look and have arrows in the same areas. On page 63 I count 5 Koka Cavalry killed. Well that's a bad start isn't it =). Hopefully I overshot on other areas, and Guts can keep his 100-man slayer title. Guts cut off the hands of a guard to save Puck in 197 who is last seen bleeding heavily in 198. Page 173 is hard to tell. There appear to be more than 5 being killed, but some of the flying body parts may have been from the first swing. The Spearman missing a portion of his face may count as 6. Also, Guts cut off the hands of a guard to save Puck in 197 who is last seen bleeding heavily in 198. Btw, just keep all the updates in one post, thanks for the help! I'm just going to renumber them when we're completley finished. Renumbering these things is... time consuming. I stand by my original count of 5. Here's my justification. Argh, how could I have missed that. It was in my notes... Thanks again though. I thought about this one for a while and... I dunno if I can count that. The guy on top looks pretty heavy, but technically Guts didn't even touch the little guy. It's in the "MAYBE" zone for now. I'm really going back and forth ... I need another opinion. Another great example of me asking myself: "how the hell did I miss that?" Geez, thanks again. This is a great project. I say after it's finished, you make all kinds of crazy lists like alleged kills, such as the 77 other Tudor mercs Guts was supposed to have killed in the 100 man fight. I'm really starting to wonder... should the bees in Lost Children count? Well his sword didn't slice THROUGH them technically, but he did kill them. So according to your rule, they should be included, if one can count them at all. YES! If you don't count them you can't count any Apostle spawn, and even Apostles come into question at that point. What, are you wussing out? You can't kill what's already dead. Guts just destroys the bodies that the ghosts possess. Then again... ghosts are dispersed from human bodies too. Hmmm... I'll think on it. It's starting to get complicated. Argh... fine fine. Hey Knight o' Skeleton, got some free time? You can't kill what's already dead. Guts just destroys the bodies that the ghosts possess. Doesn't that apply to Colette too? Doesn't that apply for Colette too? Oh yeah, I forgot she had died. My bad. I'll omit her. Anyway, I figured out a good reasoning: Artificial life doesn't count. If Skeletons/Snowmen led lives past dawn, I might reconsider. But since they'd die anyway at sun-up, and will just continue to reinhabit other skeletons/snow until then, I can't count them. THIS JUST IN: EVERYTHING GUTS KILLS "ON-SCREEN" COUNTS. That includes Ghosts, Possessions (skeleton, snowmen, etc. ), Apostles, Incubi, Ogre etc. It's the only way this list will be complete. Miura included other species and types of life, I should respect both his and Guts time in this whole series. Time to recount! PS: I'm going to rebuild the list with PHP. This effectively will include all kills, or show only humans etc. so all the different rules can apply, depending on how you want to count them. That includes Ghosts, Possessions (skeleton, snowmen, etc. ), Apostles, Succubi, Ogre etc. It's the only way this list will be complete. Miura included other species and types of life, I should respect both his and Guts time in this whole series. Time to recount! Can you technically "kill" the ghosts? Well, technically only the sun can send them away. But take volume 23 for example. Guts deserves some credit for that work. This is the best...idea...ever. But man is it going to take a while if you're now including everything Guts has destroyed "on-screen." Should make for a fun read. It's really not that difficult to count, it's entering the data in an efficient and time-manageable way that time-consuming. I have to learn PHP for this thing, for chrissake! I actually have vol 1-10 categorized with #/name/vol/ep/type of being in an Excel File now. Just thought I'd mention this one, since it's pretty easy to overlook IMHO. And there was also that scene in Volume 15 where Guts was eating that Snake, but that one was dead already, i think. Your attention to detail is impeccable, my friend. Don't worry, I'm watching out for animals. Also, Wyald is listed as a human. Well, we've always counted those. "If, in the next panel, there are a display of bodies, each one with blood, or an identifyable injury, count." Anyway, the rules have changed a bit to be more flexible. Now, anything Guts was responsible for killing goes in. 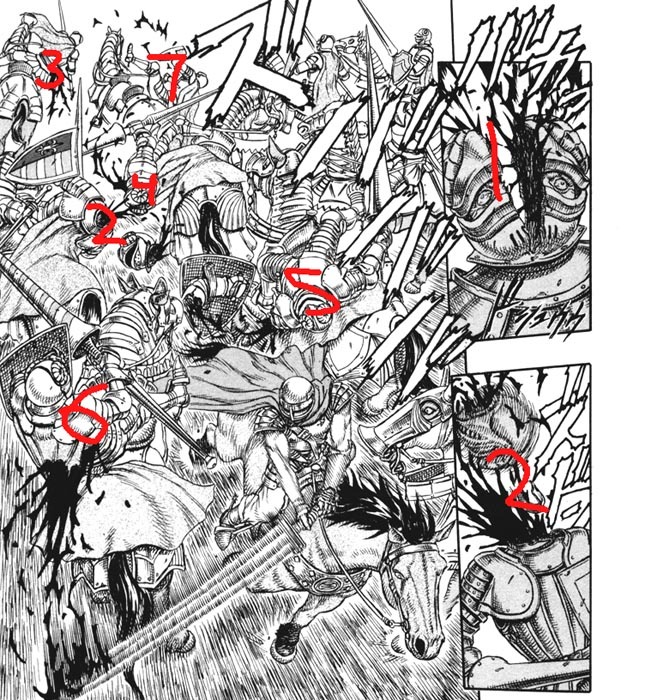 I tried counting the "elves" Guts kills at the end of Vol. 14 (which wasn't easy) . Interested to see what you come up with. Good Luck!